Sea snakes include 60 species of marine snakes from the cobra family (Elapidae). These reptiles fall into two groups: true sea snakes (subfamily Hydrophiinae) and sea kraits (subfamily Laticaudinae). The true sea snakes are most closely related to Australian cobras, while kraits are related to Asian cobras. Like their terrestrial relatives, sea snakes are highly venomous. Unlike terrestrial cobras, most sea snakes are not aggressive (with exceptions), have small fangs, and avoid delivering venom when they bite. While similar to cobras in many respects, sea snakes are fascinating, unique creatures, perfectly adapted to life in the sea. Aside from analyzing its DNA, the best way to identify a sea snake is by its tail. The two types of sea snakes have very different appearances because they have evolved to live different aquatic lives. The true sea snakes have flattened, ribbon-like bodies, with oarlike tails. Their nostrils are on top of their snouts, making it easier for them to breathe when they surface. They have small body scales and may lack belly scales entirely. True sea snake adults range from 1 to 1.5 meters (3.3 to 5 feet) in length, although a length of 3 meters is possible. These snakes crawl awkwardly on land and may become aggressive, although they cannot coil to strike. You can find both true sea snakes and kraits in the sea, but only sea kraits crawl efficiently on land. A sea krait has a flattened tail, but it has a cylindrical body, lateral nostrils, and enlarged belly scales like a terrestrial snake. A typical krait color pattern is black alternating with bands of white, blue, or gray. Sea kraits are somewhat shorter than true sea snakes. An average adult krait is about 1 meter in length, although some specimens reach 1.5 meters. Sea snakes are found throughout the coastal waters of the Indian and Pacific oceans. They do not occur in the Red Sea, Atlantic Ocean, or Caribbean Sea. Most sea snakes live in shallow water less than 30 meters (100 feet) deep because they need to surface to breathe, yet must seek their prey near the sea floor. However, the yellow-bellied sea snake (Pelamis platurus) may be found in the open ocean. The so-called "California sea snake" is Pelamis platurus. Pelamis, like other sea snakes, cannot live in cool water. Below a certain temperature, the snake is unable to digest food. Snakes may be found washed up on shores in the temperature zone, typically driven by storms. However, they call the tropics and subtropics their home. The true sea snakes are predators that eat small fish, fish eggs, and young octopuses. True sea snakes may be active during the day or at night. Sea kraits are nocturnal feeders that prefer to feed on eels, supplementing their diet with crabs, squid, and fish. While they have not been observed feeding on land, kraits return to it to digest prey. Some sea snakes host the sea snake barnacle (Platylepas ophiophila), which hitches a ride to catch food. Sea snakes (kraits) may also host parasitic ticks. Sea snakes are preyed upon by eels, sharks, large fish, sea eagles, and crocodiles. Should you find yourself stranded at sea, you can eat sea snakes (just avoid getting bitten). Like other snakes, sea snakes need to breathe air. While kraits surface for air regularly, true sea snakes can remain submerged for around 8 hours. These snakes can breathe through their skin, absorbing up to 33 percent of needed oxygen and expelling up to 90 percent of waste carbon dioxide. The left lung of a true sea snake is enlarged, running much of its body length. The lung affects the animal's buoyancy and buys it time underwater. The nostrils of a true sea snake close when the animal is underwater. While they live in the oceans, sea snakes cannot extract fresh water from the saline sea. Kraits may drink water from land or the sea surface. 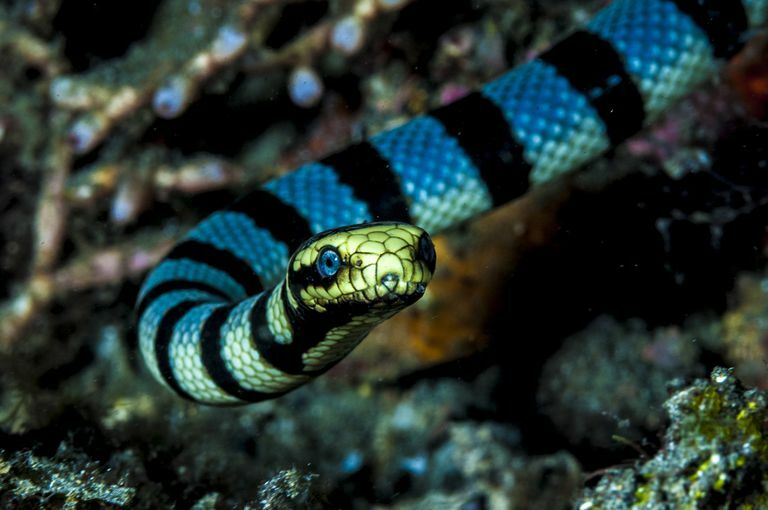 True sea snakes must wait for rain so they may drink the relatively fresh water floating on the sea's surface. Sea snakes can die of thirst. The true sea snakes may be oviparous (lay eggs) or ovoviviparous (live birth from fertilized eggs held within the female's body). The mating behavior of the reptiles is unknown, but it may be linked to the occasional schooling of large numbers of snakes. The average clutch size is 3 to 4 young, but as many as 34 young may be born. Snakes born in the water may be nearly as large as adults. The genus Laticauda is the only oviparous group of true sea snakes. These snakes lay their eggs on land. All sea kraits mate on land and lay their eggs (oviparous) in rock crevices and caves on shore. A female krait may deposit from 1 to 10 eggs before returning to the water. Like other snakes, sea snakes flick their tongues to gain chemical and thermal information about their environment. Sea snake tongues are shorter than those of regular snakes because it's easier to "taste" molecules in water than in air. Sea snakes ingest salt with prey, so the animal has special sublingual glands under its tongue that allow it to remove excess salt from its blood and expel it with a tongue flick. Scientists don't know much about sea snake vision, but it appears to play a limited role in catching prey and selecting mates. Sea snakes have special mechanoreceptors that help them sense vibration and movement. Some snakes respond to pheromones to identify mates. At least one sea snake, the olive sea snake (Aipysurus laevis), has photoreceptors in its tail that allow it to sense light. Sea snakes may be able to detect electromagnetic fields and pressure, but the cells responsible for these senses have yet to be identified. Most sea snakes are highly venomous. Some are even more venomous than cobras! The venom is a deadly mixture of neurotoxins and myotoxins. However, humans rarely get bitten, and when they do, the snakes rarely deliver venom. 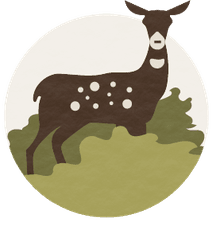 Even when envenomation (venom injection) does occur, the bite may be painless and initially produce no symptoms. It's common for some of the snake's small teeth to remain in the wound. Symptoms of sea snake poisoning occur within 30 minutes to several hours. They include headache, stiffness, and muscle pain throughout the body. Thirst, sweating, vomiting, and a thick-feeling tongue may result. Rhadomyolisis (muscle degradation) and paralysis ensue. Death occurs if the muscles involved in swallowing and respiration are affected. Because bites are so rare, antivenin is next to impossible to obtain. In Australia, a specific sea snake antivenin exists, plus the antivenin for the Ausatralian tiger snake may be used as a substitute. Elsewhere, you're pretty much out of luck. The snakes are not aggressive unless they or their nest are threatened, but it's best to leave them alone. The same caution should be applied to snakes washed up on beaches. Snakes may play dead as a defense mechanism. Even a dead or decapitated snake may bite via reflex. Sea snakes, as a whole, are not endangered. However, there are some species on the IUCN Red List. Laticauda crockeri is vulnerable, Aipysurus fuscus is endangered, and Aipysurus foliosquama (leaf-scaled sea snake) and Aipysurus apraefrontalis (short-nose sea snake) are critically endangered. Sea snakes are difficult to keep in captivity, due to their specialized diets and habitat requirements. They need to be housed in rounded tanks to avoid damaging themselves on corners. Some need to be able to exit the water. Pelamis platurus accepts goldfish as food and can survive captivity. There are several animals that resemble sea snakes. Some are relatively harmless, while others are venomous and more aggressive than their aquatic cousins. Eels are often mistaken for sea snakes because they live in the water, have a serpentine appearance, and breathe air. Some species of eels can give a nasty bite. A few are poisonous. Some species can deliver an electric shock. The sea snake's "cousin" is the cobra. Cobras are excellent swimmers that can deliver a deadly bite. While they are most often found swimming in freshwater, they are at ease in coastal saltwater, too. Other snakes, both on land and water, may be confused with sea snakes. While the true sea snakes may be recognized by their flattened bodies and oar-shaped tails, the only visible trait distinguishing sea kraits from other snakes is a somewhat flattened tail. Coborn, John. The Atlas of Snakes of the World. New Jersey: T.F.H. Publications, inc. 1991. Cogger, Hal. Reptiles and Amphibians of Australia. Sydney, NSW: Reed New Holland. p. 722, 2000. Motani, Ryosuke. "The Evolution of Marine Reptiles". Evo Edu Outreach. 2: 224–235, May, 2009.